Apparently the King of Pop also wanted to be the Sultan of Skin. News that Michael Jackson had been negotiating to purchase his assortment of racy pics before he died. Website and magazine owner Celebrity Sleuth (that's what he goes by) says that he was alerted to Jackson's interest in the photos by Jack Wishna, the Las Vegas businessman who facilitated Jackson's return to the U.S. from overseas and was trying to organize a comeback engagement for the beleaguered artist in 2006 and 2007. Turns out Wishna has been working with Sleuth on the nudeseum concept as well, according to the celebrity-skin aficionado. "Michael was one of the people to show the most interest right away and, up until literally the day before he died, I had an email from Jack saying 'M.J. wants to do this' and so forth," says Sleuth. He would not reveal the exact amount Jackson was offering, but says it was "eight figures." Sleuth has amassed memorabilia and photos taken by private photographers dating back to the 1920s. He said that they aren't all of glam-style celebs, but of other public figures as well, such as Adolf Hitler's mistress, Eva Braun. Where he got this stuff, we can only begin to imagine. "This goes back to the '20s and the '30s and the '40s," says Sleuth. "They're pictures that I've collected, bought, been given, been given by the celebrities themselves over the years. I'm the only one that has these nudes because I've been able to recognize them so I've been able to go back and find them." Sleuth says that while some of his photos have been online or published in his magazine, Jackson wanted to buy a never-before-seen collection that had been destined for his Sin City nudeseum. 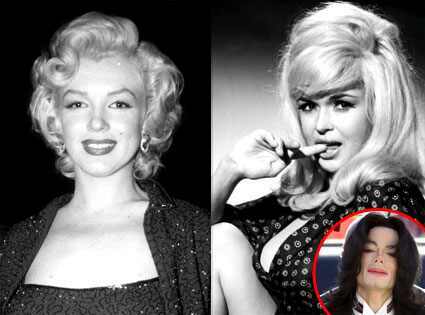 To avoid legal troubles, Sleuth refused to name the living celebrities in his collection, but revealed that he had pictures of Marilyn Monroe, Jayne Mansfield and Bonnie Parker, of Bonnie-and-Clyde fame. He says that he has pictures of just about every current famous actress as well, most of them shots taken before they became famous. "If you can think of their name and they're famous, then they're in the collection," Sleuth says. "I would say nobody in the last 65 years who is a female celebrity is not in the collection." Sleuth and Wishna are still currently trying to make a deal with a Vegas casino or private buyer to purchase the secret collection. Lordy, we're blushing just thinking about it.